Tune in and rock the blues with two guitar men who do it with great authority. First up is Arkansas wild man and original Sun Records rockabilly Sonny Burgess who still tears it up, playing his hits "We Wanna Boogie," "Red-Headed Woman" and others well into his seventies. 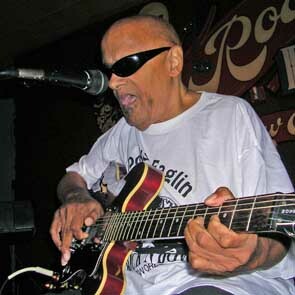 And hear a live set from the late great New Orleans bluesman and human jukebox Snooks Eaglin, recorded in 2007 at his home base, the famous Rock 'N' Bowl nightclub, where one can do either of those, or both, at the same time. Feel the beat in blues, jazz, Western swing and more with a music mix designed to rock your blues away. Tune in and rock the blues with two guitar men who do it with great authority. First up is Arkansas wild man and original Sun Records rockabilly Sonny Burgess who still tears it up, playing his hits "We Wanna Boogie," "Red-Headed Woman" and others well into his seventies. 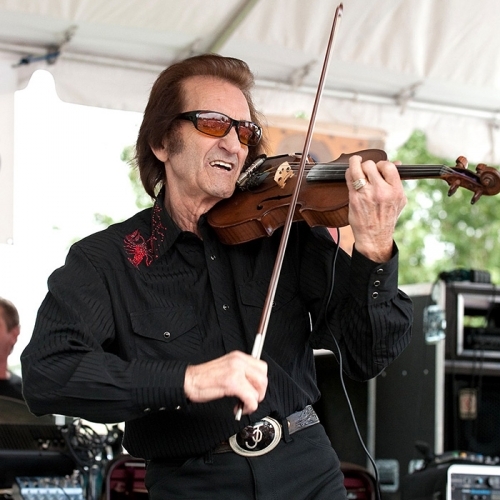 And hear a live set from the late great New Orleans bluesman and human jukebox Snooks Eaglin, recorded onstage in 2007 at his home base, the famous Rock 'n' Bowl nightclub, where one can do either of those, or both, at the same time. Feel the beat in blues, jazz, Western swing and more with a music mix designed to rock your blues away. Tune in and rock the blues with two guitar men who do it with great authority. First up is Arkansas wild man and original Sun Records rockabilly Sonny Burgess who still tears it up, playing his hits "We Wanna Boogie," "Red-Headed Woman" and others well into his seventies. And hear a live set from the great New Orleans bluesman and human jukebox Snooks Eaglin, recorded onstage at his home base, the famous Rock 'N' Bowl nightclub, where one can do either of those, or both, at the same time. Feel the beat in blues, jazz, Western swing and more with a music mix designed to rock your blues away.